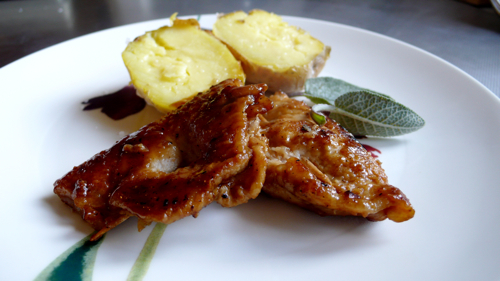 The Italian word saltimbocca means “to jump in the mouth”. This is because the meat is cooked so quickly that it will be on your plate after only a couple of pirouettes in the pan. In order to be able to cook it with the so quickly you will need very thin meat. The result is melt-in-the-mouth parcels that make what must be the world’s easiest dinner. There’s endless variations of this recipe. To keep to the deservedly famous original however, please do not overdo it, especially with sauce. Use no more than one sage leaf per parcel, that’s more than enough flavor. You can substitute pork with veal but not chicken as it’s impossible to slice it thin enough. You can substitute Vinsanto with Marsala or white wine but not with lemon juice. You can substitute guanciale with pancetta, but the guanciale is sublime. There’s no garlic and no tomato (for once). And please, please, please, don’t melt cheese over it! Top each slice of meat with 1 slice of guanciale and 1 sage leaf. Fold in two, keeping the guanciale and sage inside, and secure with a small cocktail stick. Dust each parcel lightly with flour (can be also done with gluten-free flour or rice flour ). Put a large cast iron skillet over high heat until hot. Melt 1 tablespoon butter in it until foaming. Add oil and pork parcels in single layer, turning once or twice until golden about 1 min per side. Season with salt and black pepper. Add wine to pan and deglaze over high heat until liquid is reduced by 1/3, scraping up browned bits, about 2 minutes. Be careful as it might flambe’. Transfer pork to platter, pour the sauce over it, and serve with potatoes cooked in a salt crust and a green salad. Letizia, I love the way you write! The idea of the thin meat performing pirouettes in the pan is delightful. This looks so good, and deceptively simple. Sometimes the most simple recipes can be the most tricky!!! Buonissimo piatto! Mi hai dato un bell’idea! That looks lovely, I think I may have a go. I’ve just stumbled across your blog. All looks very tasty; keep up the nice italian cooking. This may be a silly quaestion or maybe I missed it in the recipe but does the guanciale and sage end up inside of the pork or outside when you “fold in two”? Also I wonder who ruined this dish with cheese over here in the U.S. as I believe I was originally taught to make this with proscuitto, sage and cheese, usually provolone. But I agree with you I never understood the cheese and now I know why! thanks for your remark, the sage and guanciale are inside, I have corrected the recipe accordingly. Italian-American cuisine is far more rich than Italian cuisine in Italy. This blanket of melted cheese is one of my pet peeves. For the same, cheap restaurants in Italy drawn everything in layers of cream. I believe this is done to mask the poor quality of ingredients. I am for naked food, good quality ingredients need no blankets!!! Letizzia, My sleep is wound around dreams of this dish! I see that you substitute thin pork for the veal. Does the flavor of the dish vary greatly from the change in the meat?? Good prosciutto is hard to find, but we have a wonderful jowl(cheek) bacon that would be great with this dish. Kim is angry with me, because I am making the saltimbocca this week, and she will be at a conference. Sometimes we have to suffer for our work, at least that is what I am telling her. Please let me know your opinion about the pork or veal. The flavor of the dish does vary greatly with the type of meat. The original saltimbocca alla romana are made with veal, prosciutto and white wine. Mine is an Umbrian version made with pork, guanciale (jowl) and sweet wine. Why don’t you try both to see wich one you like better? So Kim can try at least one version! What can I say!! The Saltimbocca was fantastic!!! I love the concept of maximizing flavor of a dish, and still using a more common list of ingredients. The Italians are masters of making the best of what is in the pantry, and not breaking the bank to make an excellent meal! thank you so much for this recipe. Kim loved it, as well as I did. I accompanied the saltimbocca with some squash croquettes, or I would call them fritters. Very simple, diced squash/diced onion/egg/flour/salt/pepper/cayenne pepper, spooned into a medium pan, and fried until golden. Awesome way to use up plentiful summer squash! I love the way you write. I wish you would consider something in the short story format, or maybe a short novel!! thank you Jeff, your comment has made my day! And the squash croquettes is a wonderful idea, we don’t have squash yet but I love zucchini fritters with a little mint in the mix.